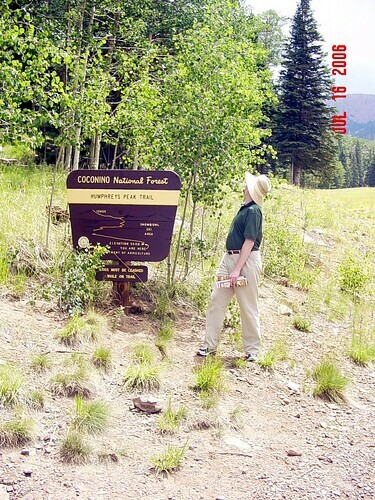 Chris at the Humphreys Trail Sign, originally uploaded by katydaqueen. We went to Flagstaff for the Celtic Festival on July 14, 15 & 16 and had a lot of fun. It was a wonderful birthday celebration. Friday we bummed around Flag, and I showed Chris the sights and points of interest from when I lived there. Saturday, we went to the Celtic Festival and had fun, then left at 1 when it began to rain (gasp- yes, actual drops of water falling from the sky). We went back to the hotel room and took a nap... We went to dinner and wandered downtown a bit more. Sunday we drove to Snowbowl and wandered a bit, then drove to Sedona and Oak Creek. A lovely time was had by all. This weekend, for my actual birthday, Mom took Chris and I out to Mcgrath's Fish House where they took a picture of me in a silly hat (grrr). Sunday, we went and saw Pirates II. Life is good, Laptop is not repaired yet, and I am busy, busy!